A few winters back I was looking for a warmer destination to spend my vacations. I was probing through different destinations in the Mediterranean when my eyes fell on Greece. I have been interested in visiting this country with its rich cultural legacy for a long time now. I did not think twice and decided to go for two weeks of this gorgeous Hellenic republic. I was clear that I wanted to see not just the mainland but also some of its stunning islands. After much research, we finally decided on a route through Athens, Meteora, Peloponeso as well as Crete, Santorini, and Mykonos. 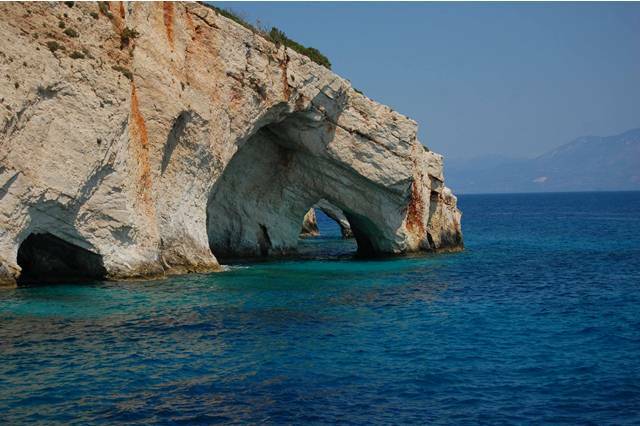 While preparing the itinerary, I had to choose between two islands called Zakynthos and Kefalonia. After much deliberation with travellers to Greece and reading lonely planet and numerous guides, I decided on the Ionian island called Zakynthos. It is not as well-known as the Cyclades, Mykonos or Santorini, but there is an award-winning beach called Navagio, known for being one of the most beautiful ones in the world. Travel insurance is mandatory to enter the Schengen area while traveling Greece. Additionally, the fact that I had to travel long distances every day made the purchase of a travel insurance quite a necessity. I had some apprehensions about driving on Greek roads, as I had heard about both rash driving as well as thefts on the highway. Though it was my first time purchasing a travel insurance, I had heard about troubles my friends had experienced while travelling internationally. Baggage losses can happen to anyone - whether through theft or because of carriers misplacing them. Flight carriers are even known to reroute luggage which can delay your luggage. In general, it is always good to also ensure that your insurance covers you in case of loss of baggage or cancellation of the trip due to unforeseeable events. What really kind of worried me, however, was the fact that falling sick while traveling was not uncommon too. Not everyone can get easily accustomed to a particular destination's climatic conditions. In case of an emergency, the costs in Greece were very high and with health, it is always advisable not to take a risk. Travel insurances are known to cover sudden medical expenses including unexpected illnesses and accidents. So for this trip, I decided on purchasing a travel insurance. I decided on the Schengen Travel Insurance from Reliance General as it had coverage above the average benefits and also offered a personalized and fast treatment. It is super economical too. You can save quite a bit in a single visit to the hospital or a health centre. They have destination specific benefits as well which cover most of the medical emergencies, including illnesses, bodily injury due to accidents and emergency evacuations. I was ready to begin one of the most awaited vacations of my life! I stayed at Athens for the day and explored the exquisite city, filled with grandiose landmarks of history we had only read about in books. It was a surreal experience visiting the Acropolis, Theatre of Dionysus, Parthenon, Temple of Zeus and so much more. It was as if my entire childhood of obsessing over Greek mythologies came alive in front of my eyes. I was wondering on how to get from Athens to the shipwreck beach in Greece. After completely being smitten by Athens, I rented a car, the cheapest I found including insurance, and headed for Zakynthos (or Zante for the locals). I travelled 287 km from Athens to Killini Port, where I had to take the ferry to cross over to the island. Zante is sure to mesmerize anyone with its dreamy beaches and an infectious air of simplicity that made me literally feel at home. 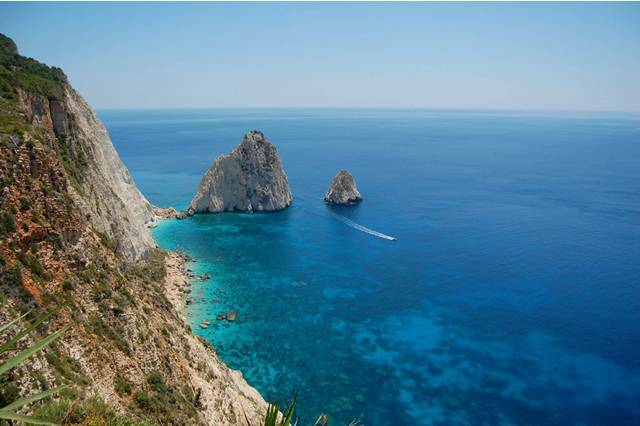 Unlike Mykonos and Santorini, or the Cyclades islands that lie in the Aegean Sea, Zakynthos is not made up of white houses with blue painted windows and doors. Zante has Italian influences. And the place was pure magic! On reaching the island I searched for the hotel address on the GPS and came across another insightful learning. Many streets in Zakynthos have no name. So one cannot always find the hotel on Maps. One had to head to the locality mentioned in the hotel address and physically ask around to locate it. I stayed in the village of Amoudi, at an inn. There is a market like street with several options for eating, buying souvenirs and so on. I spent my day looking around and in the evening, after an early but lavish Mediterranean dinner at a restaurant in Greece, I headed to the Laganas neighbourhood known for the nightlife. And quite the thrill it gave us - the energy is incredible and you find people of all ages enjoying themselves to the fullest. The next day, we quickly finished breakfast and rented a motorbike for two days to move around the island. On the first day itself, we drove to Porto Vromi. Unfortunately, the port was closed that day due to a rough sea - the officials reported they were experiencing waves of more than 2m in height. I left for another beach called Dafni Beach, recommended to us by one of the Greek natives I had met at a restaurant. I ended up enjoying the rest of the day right there. At the end of the day, I headed back to the city and strolled around for a while before returning, having bought the cruise tickets for the next day. I stayed at a hotel that is right at the entrance to the beach. I have no complaints about the service - it was top notch - however, the Greek food, though tasty, didn't agree with us. It was the Greek yoghurt which was troubling us - it is known for being rich in lactose and something which is not suited for everyone. This was another situation where our insurances came in pretty handy. We called the travel insurance company, enquiring about doctors we could consult and they sent one almost immediately, who gave me a good pack of medications. If I had to take care of the expenses myself, trust me, it would cost a fortune. The quality of life in Greece is higher than in India. But without a doubt, the main challenge you will face is dealing with the language barrier, especially in remote areas since almost no one speaks English. So make sure, you pick basic Greek and Italian words to help you get through daily situations. 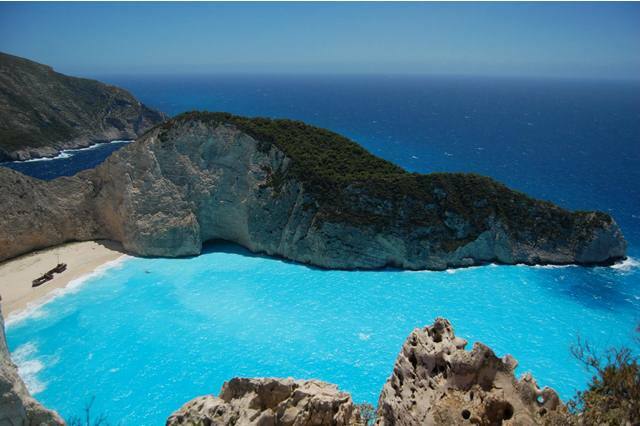 The next day, I wonder on how to get to Navagio beach. I took a bus almost from our doorstep to head to the port from where I boarded the cruise. After seeing so many photos and wonderful views, the time had finally arrived for the start of the trip to Navagio Beach. I confess that it is very difficult to write about this beach because no amount of words are enough to express its beauty. The blue of the sea is amazing and there are white pebbles everywhere. It almost seems as if someone had dyed the water. On the beach, there was a ship mysteriously stranded since 1980 that came from Turkey - one that caught everyone's eyes - intrigued tourists flocked around to admire it and wondered how did the shipwreck on Zakynthos happen? It is worth mentioning that the water is very cold, but once you get into it, the temperature almost soothes and trust me, you wouldn't want to get out for hours. I realized that we had to return only when the ship whistled. From there I went to see the Blue Caves. These too were stunning beyond words. It's no surprise that many of them have been locations for various movies and advertisements - the Blue Caves were truly a sight to behold. I also passed Marathonissi, a turtle-shaped island, which coincidentally is the spawning ground for "Caretta caretta" turtles. 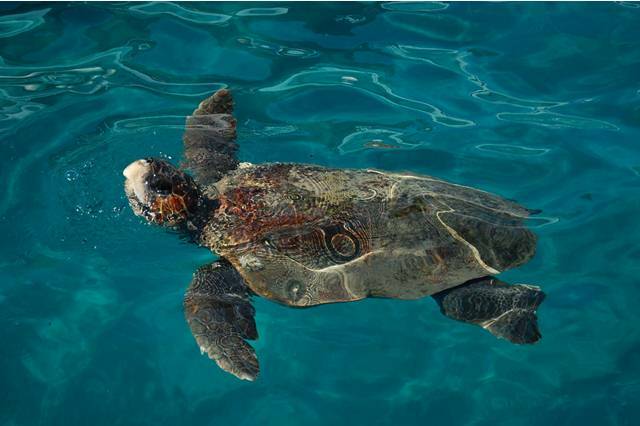 Also known as the big-headed turtles, these creatures are unfortunately close to extinction. I managed to stop at a beautiful place to bathe and went swimming into one of the coves. I love to dive, so I could not miss this opportunity in any way. Honestly, I did not want to return - I was so ready to settle down by the beach! Returning home that day and eager enough to begin the next, I did not realize that we were almost at the end of the trip. The very same evening I got a call about a family emergency and we all had to rush back home the same night. This was probably the best way my insurance helped me. It covered all my expenses, from flights to accommodations with almost negligible deductions. Though we had to head back home suddenly, it was not before we had experienced almost 4 days at this amazing destination, soaking in all the once-in-a-lifetime-experiences. Greece is a place I would recommend to everyone - whether you want to travel Greece solo, along with your partner, your family or in a group. However, what this trip also taught me was the importance of a travel insurance and made a strong advocate of it - it is an absolute must if you are heading out of the country. So go ahead and plan your dream vacation to Greece, but don't forget to be protected with an insurance. Superb photography. Great information, Going beyond the touristy SAntorini or Mykonos...that's amazing. Great post! I used to travel without insurance but hearing more issues with travellers has definitely made me a believer as well! Love your photos and looks like a great trip! What rental car company did you use? This place looks sooo stunning. So jealous that you got to see a turtle! Hello, great article :) I love Greece although I have never been there. Zacinto is on my bucket list for this summer and I hope to finally visit it and other stunning islands. Hi there, I really love your blog and thank you for sharing so much of information with us. keep posting such information for us. A great post about the places. I can understand your feeling about Greece! I`ve been there for several times! Stunning!